See all of these stacks? These are Beaded Journals that I’m working on for a bookbinding order! I need to have 40 ready in the next few weeks so lately I’ve been cutting paper, sewing, and glueing up boards. It can be a bit tiring but it’s so much fun to come up with color combos, choose paper and just do something I really enjoy. Moving on, I did finish Evening is the Whole Day by Preeta Samarasan. This was a tough book for me to get through. I found the descriptions lush and beautiful but I kept thinking the story was going nowhere. As this was an ARC, I’d love to pass it on to someone who is interested in it and perhaps you’ll enjoy it more than me. So if you’d like to read this, leave me a comment and I’ll draw a name by Friday. Man. Those journals are great!! I’m very impressed! How cool! I love journals. I have like 7 that I’ve started because I love journals but I have such a hard time sticking them out. I love starting things. It’s finishing that’s tough for me. The book sounds good from the description of it at B&N so go on, throw my name in for it if that’s ok. Thanks. I’d be interested in reading Evening is the Whole day – it sounds beautiful. I’m in the UK though and am not sure where you are or if you’d ship internationally? I don’t know if I ever asked but do you keep those books you make or sell them? How exciting! I want to see pictures when you get them all done!! Stephanie – Thank you! They are great little books you can carry around with you anywhere. tanabata – That’s right, being a lady of leisure is a good thing 🙂 And, absolutely I’ll throw your name in the drawing! Laura – No problem shipping to the U.K. so I’ll add your name to the drawing too! Lisa – I’ll post pictures because I definitely want to have that pic for myself as well! Beautiful Journals. I can see how labor intensive it is, but it looks like fun. Are your fingers hurting by the end of the day? Can you still manage to hold your book? And I’d love a chance to win Evening is the Whole Day. Gorgeous journals! Too bad about the book – the description is interesting. I love those journals!!! It sounds like a lot of work for me, but then of course I’m no expert, haha… I can’t wait to see them all done! Isabel – If I sew a lot then sometimes my fingertips are sore. Maybe I need to learn how to use a thimble! ha,ha. 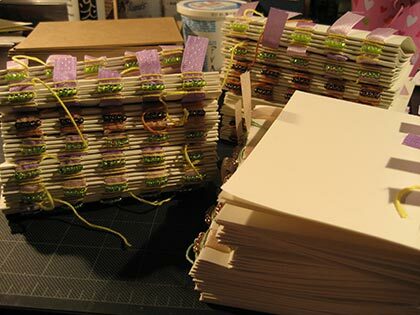 Shadan – Thank you so much girl for giving me the opportunity to put my bookbinding skills to a real test! I’m having a blast. Can’t wait to see you on Saturday. ravenous reader – Ah, thank you. I don’t sell them individually – yet! Sometime soon I hope 🙂 And, I’ll add your name to the drawing! Tara – Thank you! I’m thinking this is a book that will certainly appeal to some readers so I’m hoping the next person who gets this will enjoy it. Those journals are gorgeous! Too bad you couldn’t sell your work and make a living with such a creative job!! bethany – thank you! It is kind of time intensive and I think I didn’t quite estimate right… probably not so much the time but having all of the right supplies on hand. It’s been great fun so far. Danielle – Thank you so much. Wouldn’t that be great – I am not looking forward to getting a “real” job soon. I would rather keep crafting and being able to live off of that. Ah well….